Welcome to MikeandTheMouse: Disney Savings News! 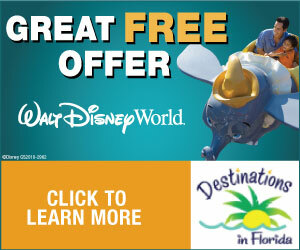 We have some new specials to announce from our great friends at Destinations in Florida Travel! Please read below for all of the details and be sure to click on their link directly below the logo to take advantage of these great savings today! NEW!! Disney Visa - FREE Dining - Disney’s Visa cardholders can get a free Disney Dining Plan for travel dates of 9/2/13 – 9/25/13. You must purchase a package that includes a minimum of 3 nights’ accommodation at a Disney Resort and a minimum 2-day Base Ticket. If you stay at a Disney Value Resort, the Quick Service Dining Plan is free. If you stay at a Disney Moderate or Deluxe Resort, the Basic Dining is free. You can also upgrade from the Quick Service to the Basic Dining for an additional $19 per adult per night and $3 per night per child. You can also upgrade from the Basic Dining to the Deluxe Dining for an additional $45 per adult per night and $20 per night per child. Book by 7/31/13. Disney will require a deposit of $200 and final payment is due 45 days prior to arrival. Both the deposit and final payment must be paid with your Disney Visa Card. This discount is currently available just for Disney Visa Cardholders, but will be released to the general public on May 9. NEW!! Disney Visa - Save Up To 30% on Rooms at Select Walt Disney World Resort Hotels - Book your room only or package reservation and save up to 30% off the Disney Resort hotels for 8/15/13 – 9/28/13.. You can book a room only or upgrade to a package with tickets. You can even add one of the Disney Dining Plans for additional savings. This discount expires on July 31, 2013. This promotion will be released to the general public on May 9. Save Up To 30% on Rooms at Select Walt Disney World Resort Hotels this Summer- Book your room only or package reservation and save up to 30% off the Disney Resort hotels for June 13-August 14, 2013. You can book a room only or upgrade to a package with tickets. You can even add one of the Disney Dining Plans for additional savings. Florida Resident Packages - Prices as low as $56 per person per day when you book a 3-Night/4-Day Package at a Disney Value Resort for Florida Residents. This package includes your room accommodations and the 4-Day Discover Ticket. This pass is good for 4 days at the Disney Theme Parks. You must show a valid Florida ID for each adult to take advantage of this discount promotion.